Finely potted with shallow rounded sides, the exterior painted with seven Immortals standing and seated in a landscape setting, picked out in wucai enamels alternating with blue and white, all below a narrow band of ruyi meander, the center of the interior with a winged, horned dragon in flight amidst clouds and flames within a double-line border, Japanese wood box. 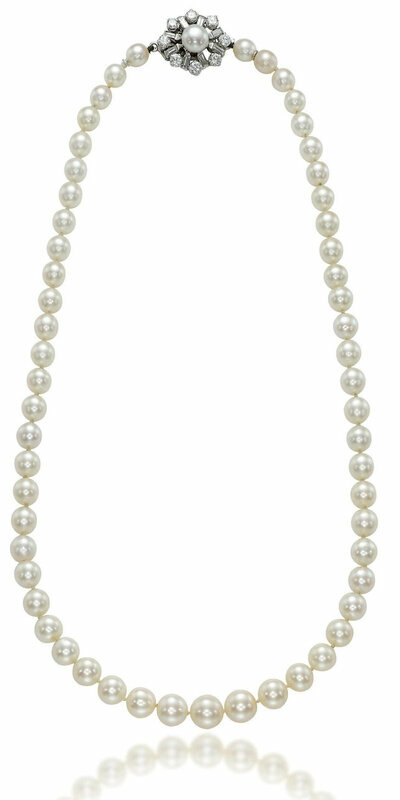 Note: A slightly smaller (9.4 cm. diam.) 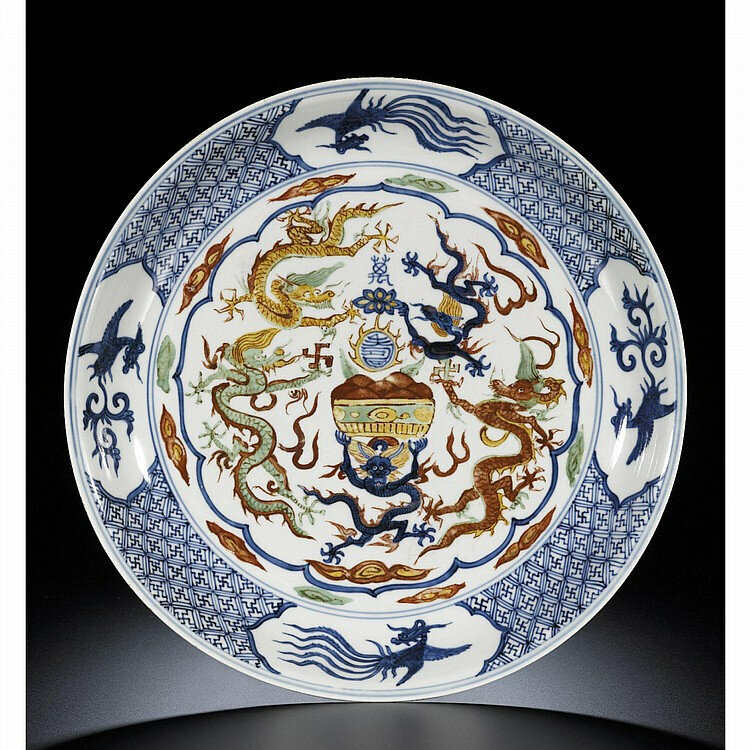 related Wanli-marked wucai bowl with an everted rim decorated on the exterior with a scene of immortals in a landscape and a leaping dragon on the interior is illustrated by R. Krahl, Chinese Ceramics in the Meiyintang Collection, vol. 2, London, 1994, no. 713. Another similar bowl, also of slightly smaller size (9.6 cm. diam.) with an everted rim, is in the Palace Museum, Beijing, and illustrated in The Complete Treasures of the Palace Museum - 38 - Porcelains in Polychrome and Contrasting Colours, Hong Kong, 1999, p. 56, no. 52. 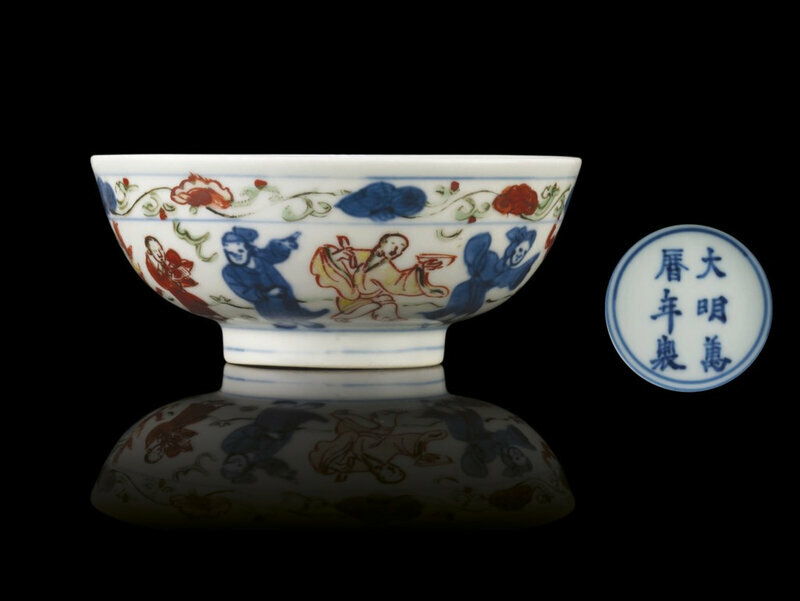 See, also, the similar bowl sold at Christie's New York, 19 September 2006, lot 267.